The biggest vinyl retailer on the high street is now Sainsbury's | What Hi-Fi? Sainsbury's is now selling vinyl records in 171 stores - the most vinyl outlets on the high street from a single retailer - as well as a not-very-good turntable. In yet another sign of the format's continued popularity, Sainsbury's has added eighteen (and only eighteen) vinyl releases to the shelves of 171 of its supermarkets. This makes Sainsbury's the owner of the most vinyl stores on the UK high street, albeit with a pretty limited selection. Album releases from Adele, Amy Winehouse, David Bowie, Fleetwood Mac, Nirvana, The Beatles and more will now be available a few aisles down from your fruit and veg, as Sainsbury's makes the most of a 70 per cent rise in vinyl sales in 2016. 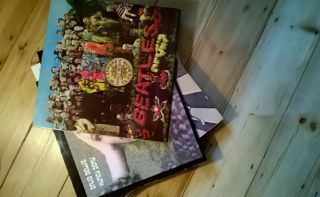 The records on offer will sell for between £12 and £20 and promise to be a mix of classics and 2016 bestsellers, though it seems that tends to amount to the same thing if the initial list is anything to go by. Pete Selby, Sainsbury's Head of Music and Books, says the vinyl revival is far from a passing fad but rather a music format with a "long term future". Well, it's certainly more emotional than picking up a new box of cornflakes. Not only will you be able to flick through (fairly quickly) a selection of records, Sainsbury's has also decided to stock - wait for it - the Crosley Cruiser turntable, yours for £80. While it's a nicely put together machine, we really think your records deserve a little better (try one of these).